I seem to be having a bit of difficulty starting this review, so I'm going to go to the old standby method of review-block breaking: the self-interview! Only, I think it's about time Isabel interviewed me. I'm pretty sure she's never had a turn. For those who are just dropping by, Isabel is my 9-month old kitten. Or, that's about how old we think she is. She's a rescue. Bookfool: Good morning to you, too, and I'm fine. It's rather important to ask questions in Human English. Izzy: Nonfurries are dull. What is Moonface about? 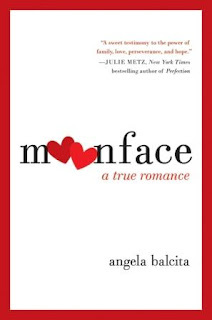 BF: Moonface is a memoir that tells about Angela Balcita's repeated kidney failures and how the man she fell in love with sacrificed a kidney for her. It's both a story of one woman's fight throughout a continuing health crisis and how love has helped her survive as well as a tremendously unforgettable true romance. Izzy: Why did you decide to read Moonface? BF: I have a friend who has had a kidney transplant due to polycystic kidney disease and she still faces constant challenges. I hoped this book would help me understand what she's gone through and what she endures, so that I can be a better friend to her. Izzy: What did you like best about this book? BF: I liked pretty much everything about it. I learned a lot, as I'd hoped. But, it's especially inspiring and touching the way a man who barely knew his girlfriend willingly sacrificed for the author. It's truly a love story. There were a number of people who were willing to give the author a kidney and that is also absolutely amazing. I also think the author is a great storyteller. Her writing has a nice flow. Izzy: The boyfriend wasn't the first person to give her a kidney, correct? BF: No, her kidney disease is a constant battle. By the time "Charlie" met Angela, she had already had one kidney replacement, thanks to her brother. The story is really focused on the romance between Charlie and Angela, though. Izzy: In particular . . .
BF: The importance to Angela that her body not reject Charlie's kidney, because if his kidney was rejected, she feared he would reject her, as well. Izzy: It smells good outside. BF: That's because it's raining and the air is very fresh. Ask me what I liked about the writing style. Izzy: Okay, what did you like about the writing style? And, please don't leave the room, again, because I feel obligated to follow. BF: Sorry, I was hungry. I love the fact that Charlie and Angela both kept their sense of humor. The book can be really funny. It's emotional, but there's always a little bit of either Angela's or Charlie's sense of humor creeping through. Izzy: What was the hardest part to read? BF: There were many difficult moments, but I found it particularly difficult to read about Angela's downturn after . . . okay, there's a part I don't want to give away, but at some point she went through a kidney rejection and she kept hoping it would turn around but it was just one of those knock-over-a-domino health moments. Things just kept cascading out of control. And, it was also very hard to read about Charlie's agony. Izzy: Apparently, donating a kidney Really Hurts. BF: Yes, and that makes this story even more heartwarming, just to know that so many people were willing to go through that kind of misery in order to keep a friend/sister/girlfriend alive. It is truly a beautiful tale of how far a few individuals are willing to go -- beyond kindness to self-sacrifice. BF: Absolutely. I'd especially recommend the book to people who like memoirs and tales of true sacrifice and love. You will love the author and Charlie. Izzy: Thank you for answering my questions. And, please . . . do not bring strangers into the house and try to let them pet me. Do. Not. Like. BF: Sorry. She was harmless, though. You'd like that so-called "stranger" if you gave her half a chance. Izzy: Hmmph. Buy Moonface. My human says it's great and I believe her. The end. I must go munch on dry food, explore underneath the drop-cloth and climb in places I don't belong. Maybe I'll check out the ceiling fan, again. ©2011 Nancy Horner. All rights reserved. If you are reading this post at a site other than Bookfoolery and Babble or its RSS feed, you are reading a stolen feed. Email bookfoolery@gmail.com for written permission to reproduce text or photos. Sounds like a book I want to read, but it's too new for my library. Maybe later. In the meanwhile, Kiki read the interview over my shoulder, and I have a feeling she plans to write about it for her Caturday post tomorrow. She likes that Izzy is talking about books, too. It's worth holding out for. Your library must be like mine. It can take as long as a year or more for a new release to show up on the "new books" shelf. This is the best and most creative review I have read in a long time. I love that the kitty was so helpful in asking the right questions about this book. I think a can of tuna is in order. Sounds also like a really good , but heartrending read. I will keep an eye out for it. Izzy and I thank you. She's on top of a cabinet, behind me, batting at the fan pull, right now. I think I'll skip the can of tuna. Hubby gave the girls real tuna when we ran out of kitty food, one time. They had . . . um . . . serious intestinal difficulties. Eeks. Moonface is excellent. It's heartreading but also very funny. The author and her fella both have a great sense of humor. Fiona Friday - Regardless of the mess . . .